We can lament the fact these people lack proper tools but that won't eliminate the issue. A significant number of hikers simply follow "road signs" and they run the greatest risk of losing their way. Installing clear and informative (directional) signs is cheaper than a search and rescue operation. I agree with you completely about the signs. Unless you really know what you're doing it can get confusing coming to junctions if there is no sign or one that is poorly executed. There are way too many junctions that have nothing at all, downed signs laying on the ground or up against a tree, ones with inadequate information, or handmade and non-official signs. I can certainly see how less experienced hikers can easily become confused because in the past it has happened to myself on occasion. Something as simple as clear, concise signage would go a long way toward helping a lot of people find their way. I believe it is a fairly simple solution that would have a tremendous benefit for many, many people and help to avoid many problems before they even have a chance to start. Maybe the signs could also list the direct line for the appropriate DEC Dispatch so they can cut out 911 as the middle man. How are fees an inconvenience? And if they are an inconvenience, why does the Loj lot fill to overflowing by 8 am on the weekend? When you factor in the total costs of hiking and backpacking (gas and gear), which can easily run into the hundreds or even thousands of dollars, I don't think a $5 or $10 parking fee is at all unreasonable. A flat fee might inconvenience local residents who use the trails more frequently, but it'd be easy enough to adopt a pricing scheme that allowed for reduced fees (or even no fees at all) for anyone with local residency. Plenty of parks that charge parking/access fees already do this. In addition to local non-profit organizations, and group that might be good to get involved in a trailhead steward program would be the Student Conservation Association, which sponsors internships for college students and recent grads in environmental organizations across the country. The SCA already helps to fund numerous seasonal positions for the DEC within the Adirondacks (including both backcountry stewards and trail crews). I don't know if the DEC has any money to help fund a trailhead steward program, but they'd probably let the stewards attend their yearly 3 day training for seasonal employees. That would give the stewards access to the same public interaction training that the Backcountry Stewards and AFRs receive. I agree with Tony's message but I do also agree with Debmonster that there definitely needs to be a proper waste disposal component included. I'm on the fence about clothing- I agree that not having appropriate clothing is rarely the cause for any backcountry incidents, but it's factor that can also quickly a bad situation much, much worse. Actually, the last climb up Big Slide increased from .29 miles to .3 miles. I could never understand why trip reports referred to the very specific .29 miles until I stumbled across a picture of the old sign. Looks like a blue trail marker is missing from the new sign? 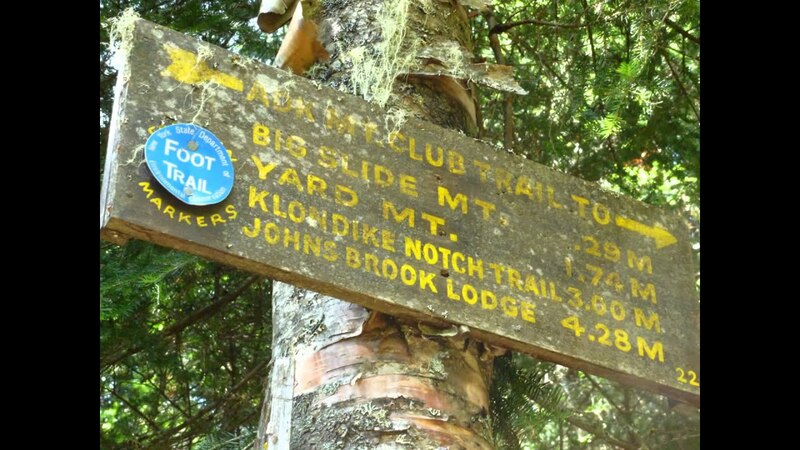 Yes, the new sign no longer reports mileage to two decimal places ... which was more accuracy than most hikers could use! It does lack a marker; I imagine the trail-crew will get around to it soon. My last visit to Big Slide was in April 2015 and, yesterday, I noticed the trail has received improvements since then. Many of the trail markers look relatively new. The yellow paint-blazes, on exposed rock, have all been refreshed. There's a pile of lumber in the woods, south of Third Brother, that might be used to create new bog-bridges (I noticed at least three new ones). The trail is flagged in places that I imagine will be serviced by the trail-crew. The two ancient staircases near Big Slide's summit continue to deteriorate; the upper one has several missing steps. There's a "DIG IT!" sign at the Porter Mtn Trail junction requesting hikers bury their waste and toilet-paper off-trail. It's the first sign I've seen addressing this issue. Not sure why it's not located at the trailhead. "DIG IT!" Was this slogan chosen by a Boomer?!? Pretty sure Millennials won't be down with this archaic colloquialism. With regards to missing signs- they do get vandalized and stolen somewhat frequently- not a huge amount, but probably more often than most people realize. Sometimes its groups looking for a souvenir, sometimes someone is pissed off because they were caught doing something illegal and ticketed, so ripping the sign down is their means of taking out their frustration. Smart DEC employees order trail junction signs in duplicate (or even triplicate) for high use areas so that they have backups ready to post immediately after one goes missing. I think we do need to remember that the High Peaks is a Wilderness Area and that there is somewhat of a reasonable expectation that visitors are going to have at least some capacity to take care of themselves and keep themselves safe. A big part of wilderness is that it gives people the ability to make mistakes and put themselves in situations that may be physically uncomfortable and outside their comfort zone. By definition, it's supposed be a challenge to navigate through a Wilderness Area- the whole point of these areas is that we're supposed to be modifying our skill level to meet the resource, not modifying the resource to meet our skill level. If we pander too much to the unprepared, then we run the risk of just encouraging more unpreparedness in the future. I would worry that trying to add information about how to reach the trailhead at every junction would facilitate this by just encouraging visitors to continue not relying on a map. Sooner or later, they are going to reach a junction that requires them to have some sort of navigational ability... and that junction could be in a place that is a lot more inaccessible and remote that an area like Big Slide. And what happens when these groups, never having needed to rely on a map, attempt peaks with unmarked trails like Allen, or the Santanonis, or the Sewards, or the Dixes? One (somewhat tongue in cheek) thought, though- what if trail junction signs only told you which way to go to get out of the woods? Then you'd always be able to reach safety, but if you had any interest in ever reaching the summit, you'd need a map (and the knowledge to use it). I think the idea of trailhead stewards and better trailhead signage is a good one. It gives people the information necessary to make good decisions for themselves without being pandering. Visitors still have opportunity to make poor choices that they can learn from in ways that no steward or sign will ever be able to facilitate. Once you start making the woods themselves easier, though, then I think you've got the potential for your efforts to backfire in the long run (and you're also further diminishing the "wild" aspect of Wilderness). Or maybe it's time to have a serious conversation about whether a Wilderness designation is still appropriate for the Eastern High Peaks. Expectation vs reality. Reality is people are navigating by trail-markers and trail-signs in a Wilderness area. Markers and signs already exist in the HPWA. Ensuring the signs provide adequate information isn't a significant dilution of a Wilderness area. In light of the recent additions of major infrastructure (new bridges and staircases), adding one more line of information to a sign seems like a paltry impingement to a Wilderness area. A cheap sign or a pricey rescue? Seeing how cash-strapped the DEC is, the cheap solution seems worth a try. I think the issue with that, though, is that the stakes can be much higher (and costly if a rescue is required) for someone to make and learn from a potential mistake. It is not as simple as missing your exit on the highway and having to turn around ten miles down the road. The consequences can be much greater and potentially dangerous. We can all say that people should go into the backcountry with the knowledge and things they need to find their own way, but as Trail Boss pointed out the fact is that many people simply don't. They rely heavily on signs at junctions and I don't see that changing, be it right or wrong. You can point out that those people are wrong and ought to be able to find their own way, and you would be quite correct, but that isn't going to stop it from happening frequently. In some cases then, when it does happen, it costs scarce money and resources to resolve. I respectfully disagree that clear signage is too much "pandering". We already have signs, I just think they could be better. Last edited by IndLk_Brett; 10-07-2016 at 01:29 PM.. I think what DSettahr may be lamenting is the degradation of the experience for the veteran hiker. As signage increases and herd paths turn into highways the sense of adventure can be lost. If it feels like one is being babysat the aspect of a wilderness experience is diminished. But where are the ill-prepared and uninformed hiking? High Peaks with marked trails. You guys already know each of those intersections like the back of your hand anyway. So explicit "You are here" signage isn't going to sour your experience. If hikers want to seek out an experience where not knowing exactly where they are is part of the attraction, there will always be lots of opportunities in the park. Believe me, I am fully aware of the possible consequences. I've helped a number of those people to get out of the woods myself. Even the Appalachian Trail, one of the most heavily trafficked trails in the US, is unmarked where it passes through the Great Gulf Wilderness in the White Mountains. The Federal Government doesn't mark trails at all (excepting maybe a small sign at junctions) in many Wilderness Areas- including high use ones, like Linville Gorge (where use levels are so high there is a permit system in place in the summer). I don't disagree that there are many aspects of the High Peaks that aren't conforming to the ideal sense of what a Wilderness is. But if we're going to continue to allow more and more modifications to the natural state of the area (some necessary for the sake of lessening impacts to the resources, others debatable for the sake of safety), then we need to stop calling it a Wilderness Area. And this isn't just semantics. People visit the High Peaks and become used to well marked trails and bridges across every stream, and they start to expect that all Wilderness Areas will (and should) be the same. It's damaging to the idea of what Wilderness is meant to be- the public calls for Wilderness designation of new lands when what they really want is non-motorized backcountry, and we end up with more Wilderness that really isn't. It also leads to lack of preparation (and greater potential for significant consequence) when they visit a truly wild area. When the public comes to expect frequent trail markers in Wilderness Areas, as is the case in the High Peaks, they are often in for a shock when visiting at area where trails are more sporadically marked (such as the West Canada Lakes, the Siamese Ponds, the Ha-De-Ron-Dah, etc.). And to be clear, I have no problem with having areas with well marked trails, bridges across every stream, etc. Not everyone wants a truly wild experience and that is absolutely OK. I enjoy having these opportunities myself, even. I also believe very strongly in having a spectrum of opportunities encompassing all desired experiences. I just think that we need to think very carefully before employing any management action that includes resource modification in response to perceived issues with visitor unpreparedness, particularly when there are other options available (modifying the skill level of the user, educating the user about alternative destinations that may be more appropriate, etc. ), and especially when that area is currently being advertised as representative of a destination that provides the greatest level of challenge. Not at all. I am fully aware of what I need to do to find that challenge. I've encountered far greater levels of challenge on the Hundred Highest especially than I ever have on any High Peak. If anything, I'm lamenting the fact that it's becoming more and more possible to devote the extensive time and effort necessary in the High Peaks Wilderness to become a 46er without also becoming a veteran hiker along the way. If you hold every hiker's hand and do everything you can to prevent them from making any mistakes, you make it much harder for them to gain the skills and experience necessary to become a "veteran hiker" themselves. This is why I feel quite strongly that if nothing else, the High Peaks without marked trails should remain forever so. It causes trepidation among many aspiring 46ers, but that's a good thing- it forces them to gain added skill, and the experience they gain along the way will make them safer hikers in the long run. What is capital-"W" Wilderness meant to be? I know it as the highest level of land protection available in the Forest Preserve's arsenal (a legal concept). In other words, an attempt to preserve the land in a natural state and minimize evidence of man's handiwork. In a perfect world, that would mean no trails, signs, bridges, lean-to's, ladders, staircases, or Interior Outposts. Now you have no evidence of man's handiwork except for passing aircraft. The problem with this lofty vision is it probably wouldn't last long. Foot traffic would eventually establish trails and all the ills we bemoan on this forum (erosion, litter, feces, TP, felling trees, etc) would begin to infect this Utopia. We're not advocating illuminated billboards or information kiosks at every junction. Just the same signs but with better information. It's hardly a big deal or a slippery slope to a Disney-like "Outdoors Land". If informative trail signs represent a significant dilution of Wilderness, then I agree with you that it may be time to invent a new classification for the HPWA. However, that sounds like a major change that is unlikely to see the light of day for years to come. So much easier to just fix the existing signs. What about the possibility of invoices for being rescued? I would love it to be a sliding scale depending upon the stupidity level that caused it, but that's probably wishful thinking. Maybe a sign at the trailhead that says something like "You will be required to pay for any DEC rescue, so make sure you are prepared." That might drill it into people's heads. Especially after people start to "know people" who had to pay up. This is the issue that was raised in New Hampshire. After much debate, they implemented the Hike Safe card. In a nutshell, it’s “rescue insurance” for backcountry users. The cost of your rescue is covered even if you are found to be negligent (no flashlight, compass, etc) but NOT if you are deemed to be reckless (like heading into the teeth of a storm with a known medical condition). If you require rescue and don’t have a Hike Safe card and are NOT negligent, you’re NOT charged for the rescue. If New Yorkers like the sound of that, then they ought to contact their elected officials and get the ball rolling. Perhaps not (probably not, even) in the Eastern High Peaks. But there are numerous places, even in the Adirondacks, where this "lofty vision" (or something close to it) is the current status quo. There are some Wild Forest areas even that pretty well already approximate this "lofty vision." I suspect also that with lean-to removal, a lot of moderate to high use areas would probably also see a significant drop in total use levels, and an equivalent reduction in the number of "ills" associated with those areas. Yet when the DEC proposes lean-to removal, there is always an outcry, often from those same individuals and organizations that called for Wilderness designation to begin with. Interesting aside- there are apparently some areas that the US Forest Service has avoided pushing a Wilderness designation for because of the problems associated with the hiking community's misguided view that Wilderness Areas are meant to be recreation playground first and foremost. But what you are advocating for is a High Peaks where it's not necessary at all to carry a map, ever, where there is never any consequence choosing not to do so. Correct me if I'm wrong on this, but this is how I interpreted your and IndLk_Brett's posts. I seriously believe that this has the potential to lead to a lot more problems with poorly prepared hikers in the long run. I think that's a great idea. Easy to manage, too. The infrastructure is already there with the sporting licenses. If it would offset the cost of rescues, and maybe free up some cash to increase ranger presence, I would definitely pay 35 bucks a year "just in case." The Adirondacks called, they said you've been promoted from "Trail Boss" to "Park Boss"....Congratulations! ...But what you are advocating for is a High Peaks where it's not necessary at all to carry a map, ever, where there is never any consequence choosing not to do so. All I'm saying is that junctions should at least indicate where all roads lead. For example, the one below Big Slide is a three-way junction and only two of the three are described by the signs. Indicating the third one leads back to JBL or the Garden seems like a common-sense notion. There are enough trails in the High Peaks to warrant having a map. It would be a helluva trick to make every sign describe all possible permutations to get from A to B and I'm certainly not advocating that. Wrong citizenship for the job (remember?). That's why it's up to New Yorkers to prod their representatives. That's not at all what I am saying. I feel you have taken the point and exaggerated it way too far. I think that on official DEC trails major or confusing juntions should have better signage that facilitates easier navigation. That is hardly the entire High Peaks and that certainty wouldn't make a map an obsolete tool. The map still is needed to show the overall route and area, the clear signage to eliminate some of the confusion less experienced hikers may have about where precisely on the trail/map they are and which spur corresponds with what they may be seeing on the map. Presently, it is a mixed bag of helpful signs along with many that are often missing, damaged, or inadequate. I have even been confused at times with a map when there are multiple junctions in a relatively small area or multiple spurs from one junction! I'm not advocating for people to use no map and I'm not saying every herd path or spur trail needs a marker. But I am saying that major DEC trails ought to have them and they ought to be clear about where each way goes. This is already done in many places, but there are still far too many where no sign exists at all. Secondly, it is a real world reality that, right or wrong, the major DEC trails in the High Peaks have a large number of newer hikers with no map in their pocket. Bad practice, yes, but we all know it is common. To me you're basically saying "let them get lost and learn a lesson, serves them right for being unprepared and next time they will do better". While that may be true, it can't work like that. In the end something is going to be needed to 'save them from themselves'. Is that better done with a sign directing them which is the correct way to go or by rousing rangers and a SAR team? You said I'm saying it should be so people need no map anywhere in the High Peaks and that simply is not true. I do, however, think that when the inevitable first timers come to hike Marcy because it's the highest mountain there need to be signs in place to get them up and down safely when they show up with no map. Because they will. And there are just too many major negative consequences to not doing so. It becomes almost just as irresponsible to not do it when you know so certainly that a huge number of inexperienced hikers will be heading down the trail. That doesn't necessarily mean you are coddling people - it simply means you're being realistic and solving a problem the most efficient way possible. Lastly, you had suggested that hikers should learn skills as they spend more time on the trail and you are absolutely correct that they should. However, I would dare to say that a great many hikers in the High Peaks have zero interest in becoming a seasoned hiker, much less a 46er. They are there a day or two on a vacation and may never step foot on a trail again. As such they have no interest in acquiring those skills. What of those people? Are they expected to know wilderness navigation in order to safely enjoy the High Peaks too? The land is not there for avid hikers only, it is there for the entire public's collective benefit and enjoyment so I suppose they should be given safe access in at least some areas. If a good sign can facilitate that safe access and help to keep them from calling 911 for a rescue I think that's a win on both sides and at a very minor cost. That still leaves the overwhelming majority trailless and signless. Last edited by IndLk_Brett; 10-08-2016 at 01:14 AM..